It’s Looney Toons in Geneva! I’ve always wondered why those fine Warner Brothers folks chose a coyote as one of their prime cartoon protagonists, until now that is. And they never should’ve portrayed Wile E. as an incessant bumbler because our feral furry friends manage to get the best of Geneva’s human population every single time! 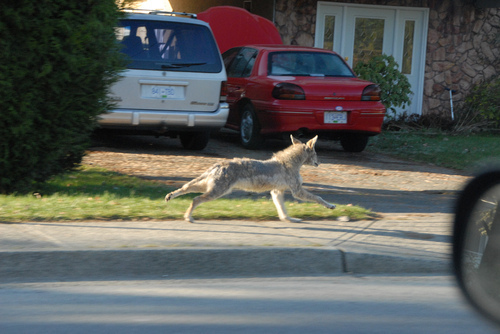 So after years of complaints from west side residents and having the police waste their time by tracking 131 coyote sightings since June, last night, the City Council recommended having the Humane Society present a public workshop on how to handle the crafty critters. Limited to 50 attendees, the proceedings will be taped for the entire citizenry to review. And while I certainly love the Humane Society and their ongoing animal protection efforts, the truth is, west siders don’t want to have to deal with coyotes, they want someone else to do it for them. I know this because I have to live with these people. Please pray for me! I’ve been writing this for years. In order for hazing to be effective, you have to chase the beasts and you have to mean it. Their fear of humans has to be consistently reinforced. And, by the way, that tactic works well pretty with particularly annoying west side residents too. Another effective tactic, per those knowledgeable Peck farm folks, is marking your territory. And all that takes is a couple of Old Styles and the cover of darkness. Remember 84 year-old Bensenville resident Dolly Jefferson? Last July, when her neighbor’s dog was under siege by a pack of four coyotes – one of whom was a massive hundred pounder – she flew out her back door and single-handedly sent the ambitious creatures into full flight. And she’d already had both knees replaced! So don’t tell me that some portly platinum blond 40-something Westhaven subdivision housewife couldn’t do the same bleepin’ thing – complete with cellphone pasted to her right ear the entire time. Oh yeah! That reminds me! If you don’t want coyotes making a snack out of little Fifi, then don’t leave her out back unattended. But just like Bill said, isn’t that the real rub! West side Genevans can’t bothered with supervising their pets or, God forbid, their children. Given the vast and regular Fisher Farms coyote sightings, my doggies don’t go out back without me. And we have a fenced yard. Undeterred by the facts, and since west side residents firmly believe they have nothing better to do, now the Geneva Police are going to start fending off the most fearsome critters with paint ball guns, copper balls, and bear spray. So now coyotes will learn to hide whenever they see those distinctive GPD patrol cars. Perhaps someone should tell the alderman that not only are paintball guns legal, but – and I’m certainly not encouraging this – residents can openly carry firearms throughout any Geneva neighborhood. Though I would be willing to say that paintball guns are just about the Geneva Police Department’s speed. At the same council meeting, one Fisher Farms resident, whom I fervently hope hasn’t reproduced, suggested cutting down the prairie grass around the FAA beacon in the center of the subdivision to deter denning. So now they’ll just move two short blocks west to that Peck Road farmland. Trapping coyotes doesn’t work. Shooting coyotes doesn’t work. Relocating coyotes doesn’t work. Again, the only thing that works is consistently reinforcing their fear of humans and that means chasing them away EVERY time you see one. So why is the City of Geneva wasting any more time on this? While only two alderman asked any questions about the new City budget, they all asked a plethora of questions about coyotes. It’s good to know they have their priorities straight. At the mere cost of a $500 donation and paying for staff travel time, the Humane Society involvement is a welcome and worthwhile endeavor. Some residents may well benefit from their expert instruction. But then there’s all that GPD time. And shouldn’t the council and city administrators be a wee bit more concerned with how to handle the looming state budget cuts? I doubt Governor Rauner will get his full 50 percent of our municipality’s share of the state income tax, but, trust me, he will get something. Much like it is with far too many of my west side residents, like it or not, coyotes are here to stay and we’re going to have to do our best to deal with them. Ah well! At least the coyotes don’t have a massive entitlement complex. I was referring to any projectile that leaves your private property is in violation of ordinance. (You should have heard me say that) There is also the portion of the population that, not recognizing what a paintball gun looks like, will think there are people running about firing assault weapons, get completely unhinged and call out SWAT for an active shooter. Though I certainly appreciate your opinion, my comment on your own Universe goes well beyond this particular instance. And I would be willing to argue to some of the other aldermen feel the same way. Your “logic” on a variety of subjects frequently escapes me. And if you’re worried about paintball guns, I would like to direct you to Airsoft’s offerings which look a lot more like the real thing than they probably should. Though I wouldn’t stake my life on it, I do not believe any specific ordinance prohibits the use of paintballs within the city limits. Of course, shooting some unsuspecting citizens would likely be a violation of several statutes. The bottom line is, why does the city council let a budget – compiled by Mary McKittrick and Stephanie Dawkins no less – go unquestioned, but spends half the meeting (an exaggeration) on coyotes? There is nothing that can be done to stop suburban coyotes and the city council really needs to move on to other far more important things. We continue to build homes in THEIR habitat, whether it’s coyotes eating their dogs or deer eating their landscape, and they continue to want them all executed. Why can’t we all just coexist without having to destroy one species or another? Coyotes lived here first, deal with it people. Maybe these people should move to Chicago where their efforts might actually rid the world of rats! But that’s not the American way! Our country was founded on the principle of Europeans moving here, running off or killing off anything that was already here (be it human or any other species) then bringing in other plant/animal species from other countries/continents to take over and try to mold it to our liking.